- Sizes: 1" to 6"
Automatic chain link machine for making all sizes of chain link fence. Our linking machine can be used in all kinds of knittings. It can make the most diffucult stitches with its double speed motor. 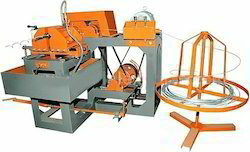 This machine is ideal for making different design of necks. It provide maximum efficiency and an outstanding cost-to-performance ratio and operating convenience. Packing Measurement: 20" x 24.5" x 10"
Running with an aim to meet the requirements of our valued clients, we are actively committed towards manufacturing and supplying high quality Linking Machine.